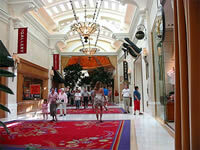 Introducing Wynn Las Vegas, a total resort experience. Treat your senses with innovative spa treatments, fine dining, luxury shopping and a resort golf course on the Las Vegas strip. First, it’s the key to your room. And it’s also your player’s club card. But that’s just the beginning. The red card is the first step in establishing the kind of personal relationship that you expect from a resort like Wynn Las Vegas–and the most remarkable casino in the world. Use it when you play slots or table games and become a rated player. Simply insert your red card into the card reader of your favorite slot machine or hand it to the dealer at your favorite table game, and you’re on your way. When you’re a guest at our Resort, you’re already a red card holder, which means preferred access to the world of Wynn Las Vegas. You can use your red card to secure your coveted reservations at our fine restaurants or shows. Use it at the Wynn Country Club to make tee times on our Tom Fazio-designed golf course. Use it anywhere and everywhere at Wynn Las Vegas, and find out what “VIP” really means. If you’re not staying at the Resort, just visit the red card desk in the casino or take a seat at one of our tables. Present your driver’s license or passport and you’ll be presented with your red card. It’s easy to mistake any of our rooms and suites for a stylish apartment in Manhattan, London or Rome. And while you’re here, it’s yours. A resort room in the Tower Suites section of the hotel.The South Tower Suites and Fairway Villas have the unmistakable feel of an intimate residential apartment. All suites and rooms in the Tower Suites are accessed through a private gated entry with private VIP check-in at the exclusive Tower Suites Lobby. Each room offers an elegant informality and is equipped with VOIP telephones, fax, high speed Internet access and flat screen LCD high-definition television. Additional features: separate check-in, convenient restaurant, and a terrace with private pools. 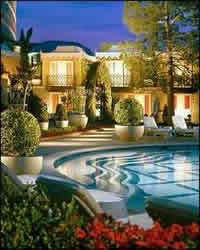 A chic, cosmopolitan living and entertaining area offers you an unbelievable view of the sparkling Las Vegas Strip. And, it adjoins the most inviting bedroom you’ve ever had the pleasure to dream in. Marble covers every surface in our enormous bathrooms, complete with soaking tub and separate shower, not to mention your own 13″ flat-screen TV. If you’re conducting business, you may choose one of our Salon Suites equipped with a conference table for 10 and expanded catering services. Additional features: separate check in, convenient restaurant, and a terrace with private pools. Imagine a posh apartment at the city’s most exclusive address, decorated by a gifted designer. Suddenly, it’s yours. Mix perfect martinis for your friends at the wet bar. Wow them with your view of the Strip (or show them the exact spot on the 18th green where your dream finally met reality). Then, float in the soaking tub and get ready for an unforgettable Las Vegas night. Additional features: separate check-in, convenient restaurant, and a terrace with private pools. Separate lifetime from dreamtime in Las Vegas’ most stylish sitting area, complete with floor-to-ceiling windows that span the room from wall to wall (over 26 feet). The view and the feeling are equally breathtaking. Marvel at the fascinating contrasts presented by the sparkling architecture of Las Vegas and the desert mountains that surround the city. Additional features: separate check-in, convenient restaurant, and a terrace with private pools. Conceived as a home-away-from-home and to exacting specifications, the Fairway Villas are without comparison, Luxuriously spacious, strikingly designed with extraordinary views of our exclusive golf course from your balcony, they offer a serene counterpoint to the excitement of the Resort and its many distractions. Additional features: separate check in, convenient restaurant, and terrace with a private pool. The main casino offers the full complement of tables games, such as Baccarat, Blackjack, Big 6, Caribbean Stud®, European Roulette, Let it Ride®, Mini Baccarat, Pai Gow Poker, Roulette, and Three Card Poker and Casino War®. Guests of our resort can also enjoy a poolside game of Blackjack at our Cabana Bar and Casino. While many of our 1,900 Slots consist of reel spinning, video reel and video poker machines in denominations ranging from 1¢ to $5,000, including a number of exclusive slot experiences. This industry classic has been updated, combining the Megabuck’s life-changing jackpots with the appeal of a spinning wheel and the charm of our Chairman, Steve Wynn. Steve Wynn collaborated with the industry’s leading game designers to bring you this $10,000,000+ penny slot machine. This industry first is a FREE bingo game available to everyone actively playing in the casino. Just pick your favorite slot game, insert your red card and start playing. At random intervals, a casino-wide bingo game will be launched and up to $10,000 will be awarded. No Cost. No Decisions. Just Free Jackpots. A Wynn-exclusive progressive slot machine where 25¢, $1 or $5 slot players vie for jackpots over $100,000. While big jackpots appeal to most, everyone will love this unique version of Blazing 7s where players can contend for high-hit frequency jackpots up to $1,000. One of the newest sensations to hit slot floors has been enhanced to create the Wynn Signature Series – Cash for Life machine. Play a game, spin a wheel and win a life-time worth of payments and memories. This player favorite has been enhanced for Wynn Las Vegas with more spins and more jackpots. Offered in 25¢ denomination. Our twenty-six table poker room offers a variety of games and limits to suit all levels of play. Test your skills and your luck with Hold’Em, Omaha Hi-Low, and mixed game combinations. These games are generally offered at limits ranging from $4/$8 up to $100/$200. Higher limit games are often available for the more adventurous player. We also offer pot-limit and no-limit games. Enjoy the excitement of a Las Vegas sports book in the comfort of a lounge setting. Our “Book” offers bettors the opportunity to wager on current and future U.S. Sporting and racing events. If you’ve ever dined on the French Riviera, you’ve had a taste of the delicate flavors of Alex. Chef Alessandro Stratta brings Riviera Cuisine to perfection. 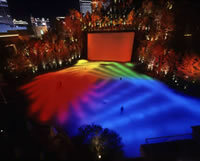 And only to Wynn Las Vegas. A decadent twist on early French-influenced Shanghai, the dramatic décor at this elegant restaurant is as unique as its sumptuous Chinese cuisine. Executive Chef Richard Chen blends a masterful mix of refined Cantonese, Shanghai and Szechwan cooking styles. Open daily. Chef David Walzog presents his unique interpretation of the Classic American Steakhouse along the Lake of Dreams. Open daily. Chef Daniel Boulud has once again teamed up with executive chef Philippe Rispoli to bring their modern flair to this bustling French Brasserie. Open daily. Chef Paul Bartolotta celebrates the traditions of Italian cuisine at his signature Bartolotta Ristorante di Mare, with fresh seafood flown in daily from fish markets throughout Europe in addition to pasta and classic Italian specialties. Open daily. Chef Masa Ishizawa brings a new Japanese dining experience to Okada. With authentic teppanyaki and robata cooking, modern Japanese creations and sushi that holds its own in any language, he expertly marries fresh produce with a variety of fish selections to create innovative pairings. The dramatic setting melds elegant contemporary interiors and a spectacular Japanese garden. Designed by the architectural firm Hirsch Bedner, the restaurant is characterized by the clean lines of contemporary Japanese architecture and draws further inspiration from traditional cultural symbols and icons. With its sweeping views of the fairways and 18th hole waterfall – The Country Club is an ideal spot for breakfast, lunch and dinner. Executive Chef Rene Lenger brings his success from New York’s dining hot spots, Strip House, Michael Jordan’s and Monkey Bar – where he specialized in classic steak preparation – to the Las Vegas Strip. Under Lenger’s supervision, Strip House was named as one of the “Forbes 2003 All-Star Eateries in New York.” Open daily. Experience the excitement and bold flavors of Southeast Asian cuisine at Chef Hisham Johari’s Red 8. A casual restaurant serving authentic tastes from Cantonese noodle dishes to Hong Kong-style dim sum and barbecue. Open daily. 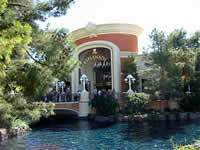 Wynn’s signature restaurant is Tableau, an airy, atrium setting surrounded by poolside views. Chef Mark LoRusso’s impeccably prepared cuisine showcases the finest American ingredients, prepared with French flair. Open daily. Chef Stephen Kalt’s interpretive style pays homage to everything special about modern and traditional Italian cooking. Chef Kalt’s famous wood grilled pizzas – the best in town – are also available. Open daily. The second collaboration of Tom Fazio, Steve Wynn and Mother Nature has resulted in 18 unforgettable holes. Right outside our back door. And exclusively for our guests. Golfers will be required to wear a shirt with a collar, soft spikes and golf-appropriate pants (no jeans). Shorts are allowed as long as they are no higher than mid-thigh. Over 800,000 cubic yards of earth were moved to create the dramatic elevation changes considered impossible on the Las Vegas Strip! The Salon at Wynn Las Vegas has been conceived to help create a more beautiful you, inside and out. Relax in the care of highly trained professionals. Whether you’re here for a simple manicure or a pre-wedding updo, our treatments are highly personalized and always tailored to your needs and interests. The Salon welcomes resort guests, guests of other hotels and the local community from 9:00 am to 7:00 PM. In every age, for all generations, Truefitt & Hill is an invaluable asset to the well groomed man. Combining their finely crafted products with our personalized barbershop services, we provide everything a gentleman needs to put his best face forward. The spa offers 45 treatment rooms for massage, body treatments, facials and hydrotherapy. Separate women’s and men’s facilities with showers, steam room, sauna and whirlpool ensure your comfort and privacy. Lockers with spa robes and slippers are provided, as well as hair and body care amenities. Because a body’s needs change on a daily basis, our massages are customized to your specific needs by our staff of highly trained massage therapists. 50 or 80 minutes. 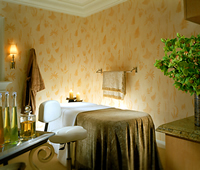 Our award winning Mobil Four Star Spa is available exclusively to the guests of Wynn Las Vegas. The Salon welcomes guests from the local community. Please call our direct Spa and Salon reservations line at (702) 770-3900. We suggest that you make reservations in advance so that you are able to secure your preferred time and treatment. Please arrive at least 30 minutes prior to your scheduled spa appointment and 5 minutes prior to your salon appointment to allow enough time to check in. For those with a reserved spa treatment or in- room massage, there are no additional charges for spa facility use. Use of the spa and fitness facilities, without a treatment reservation, will incur a daily fee of $25. The Spa and all of its facilities, including the Fitness Center, are appropriate for guests 18 years and older. Guests under the age of 18 are welcome to receive salon services when accompanied by an adult. Guests who have high blood pressure, heart conditions, are pregnant, have had recent surgery, or have any other medical concerns are advised to consult their doctor before booking spa services or using any spa facilities. Please advise us of allergies so that we may use products that are appropriate for you. As a courtesy to all, we ask that a six-hour notice be given if you need to cancel or change your appointment with us. For a cancellation with less than a six-hour notification, guests will be charged 50% of the treatment fee. There will be no charge if we can re-book your appointment. For no-show appointments, the full treatment fee will be charged.